For complicated ownership issues, this blogger turns to IP ownership guru Pamela Chestek. She reports here at her Property, intangible blog on the most complicated ownership case she has ever seen: C.F.M. Distributing Company, Inc. v. Theresa Costantine, as Personal Representative of the Estate of Richard Costantine, Opposition No. 91185766 et al. (March 20, 2013) [not precedential]. The dispute took the form of a pair of Section 2(d) oppositions to registration of the two marks shown immediately below, for restaurant services. 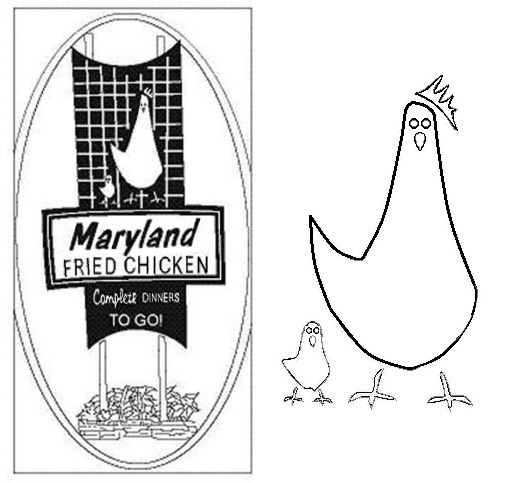 Judge David Bucher, writing for the Board, painstakingly set out the complicated history of the MARYLAND FRIED CHICKEN marks. He found helpful Ms. Chestek's article, "Who Owns the Mark? A Single Framework for Resolving Trademark Disputes," in the May-June 2006 Trademark Reporter (pdf here). Ms. Chestek, in her blog post, discusses the Board's analysis of the ownership issue, which is based on the approach suggested in her article. We are faced herein with an extended family spat that has been building for decades over the ownership of asserted source-indicators for restaurants selling pressure-fried chicken. These disputes have survived the passing of three brothers from what has been popularly referred to as "the greatest generation," including significantly for this proceeding, Richard Costantine’s death in 2008. 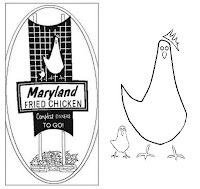 The disagreements all arise from a string of restaurant s begun in the 1960s in the Orlando, Florida area trading under the name, “Maryland Fried Chicken.” While all the parties to this litigation seem to agree that in the context of fast food restaurants, this three-word term, “Maryland Fried Chicken,” retains substantially no source-indicating capacity, that has not stopped constant disagreements over a range of cartoon-like fowl images alone and within a variety of composite Maryland Fried Chicken service marks and trademarks, apparently used in Central Florida by both related and unrelated parties since the 1960s. Observing that "the traditional concepts of priority and likelihood of confusion are of little help in resolving these disputes," the Board sustained the opposition, finding that the applicant was not the owner of the marks at the time the applications were filed, and consequently, the two involved applications were void ab initio. And so the Board sustained the oppositions. TTABlog postscript: This decision was affirmed per curiam by the CAFC on February 10. 2014. This case is now on appeal with CAFC. Pending before the TTAB yet another attempt to gain exclusivity. Application No. 77752805 pending.